Everyone knows New Jersey is taxed out; the state already has one of the worst tax climates in the nation, and a recent poll confirmed people aren’t satisfied with the services they’re receiving for it. When the Senate President says it, however, and says it when budget season is in full swing in Trenton, the idea takes on greater significance. Senate President Stephen Sweeney has been on a mission to get the budget’s structural problems under control for this simple reason: Nothing positive government wants to do—from giving tax cuts to voters to funding popular programs—can happen without changes to the way the state provides retirement and the health benefits for public employees. NJBIA has supported many of the reforms Sweeney has proposed in his Path to Progress report, including changing the pension for new state workers to a combination defined benefit-401(k) system and providing public employees with Affordable Care Act gold-level health benefits, instead of the platinum-level plans they receive now. Certain state government workers recently agreed to significant health plan changes that are part of about $800 million in total healthcare savings in the FY 2020 budget. 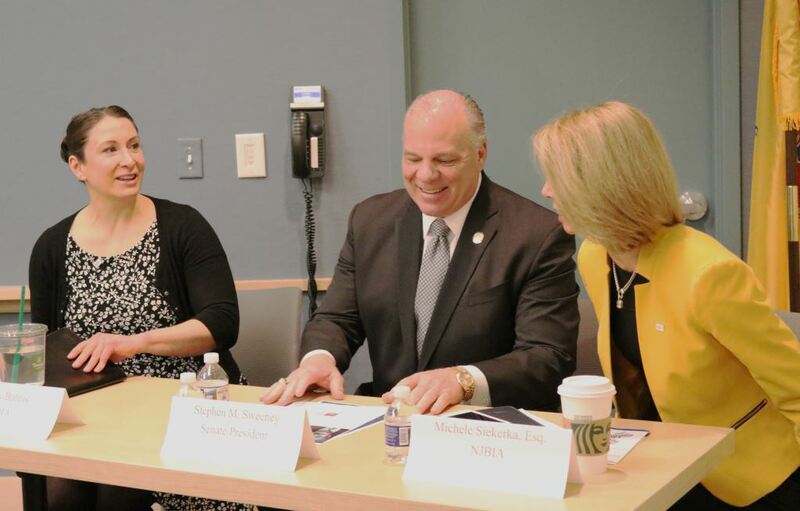 Sweeney wants to extend that reform to employees in the education system, which would not only save the state money, but also rein in local property taxes. Public employee unions are pushing back hard, however, even though the reforms are reasonable. Sweeney pointed out that he has been a union representative his whole adult life and would not pursue policies that are going to hurt workers. “Not one person who is vested in the pension system is going to be harmed,” Sweeney said of his plan. “Anyone who’s been promised a pension is going to get exactly what they’ve been promised.” Only new workers would get the changed pension, which would help reduce the state’s long-term pension liability, which is near $115 billion. He also pointed out that the cost of providing a teacher’s family healthcare under the State Education Health Benefit Plan is $39,000, on average. And that’s down from $42,000 last year. Merging teachers’ healthcare plans with those agreed to by public workers for this year’s budget could save hundreds of millions of dollars, even though the state worker plans will still cost an average $27,000 for family coverage. The savings could be put back into the school system, he said, or even used to cut taxes. “That’s what we would like to do, to show the country we’re getting our act together and we’re bringing taxes down,” Sweeney said. Anybody interested in buying the Brooklyn Bridge? Of all the politicians in NJ Senator Sweeney is the only one who speaks with common sense. He is not trying to hurt public workers.. He knows every time the tax rates go up, be it sales, fuel, income or property more people simply “vote with their feet” and move out of New Jersey. Senator Sweeney, unlike most politicians, is not looking at the next year or two, or what’s good for his next election, but what is good for our state OVER THE LONG RUN. After being in office for decades, Sweeney suddenly sees the political advantage of fiscal responsibility. Sorry Mike, I don’t trust this guy or his motivations. Mr. Sweeney , Bravo. Finally a “D” that understands the State is in serious trouble and everyone has to pitch in. I only disagree that the existing Vested people who have not retired must also be adjusted to align with the private sector. What is fair is fair. I support his efforts and hope he is successful. I also encourage Michele Siekerka and the NJBIA to continue to apply pressure to the State. I believe their work is opening the eyes of NJ State politicians. Is that $39,000 per year per employee? Here is an actual plan for adequate coverage per person, $600 a month so a year it is $7,200 so let’s say there are 2 adults and a child using individual policies = $21.600. When will Trenton give the responsibility to the employee, offer the employee $25,000 and have them find the plan they want for $25,000. Trenton has to stop planning the employees life, it’s time employees become involved with their responsibilities. Thanks for the comment, Vivian. To answer your question: Yes, the Senate President said the average cost of a plan for family coverage for a state employee is $39,000 per year, and that is down from $42,000. The NJEA has 200,000 members and the parent National Education Association (NEA) has 3 million members. The NJEA Executive Director’s compensation is seven times that of the NJ governor. AT&T was dissolved because of its monopoly and membership of 1 million employees. The hard working business people and tax payers of NJ are routinely being ignored while the NJEA bosses in Trenton RULE…. There is no democracy in New Jersey…. Our NJ Attorney General Gurbir S. Grewel and Supreme Court Justice Stuart Rabner are sound at sleep while the hard working taxpayers are exiting New Jersey in rapidly growing numbers. Just another reason to leave NJ taking all of my taxes with me. Good bye, you horrible, corrupt, moral-less bottom feeders we call NJ government and teacher unions. Kudos to NJBIA for keeping the focus on the key issues of our state’s many dilemmas with actual facts and figures. You can’t tackle a problem as large as this in one fail swoop; but, starting with a clean slate of new rules going forward is a good place to start. Course corrections with a ship of state the size of New Jersey will be slow, but the messages which identify (and hopefully) address the problems will be warmly welcomed by residents and businesses alike.